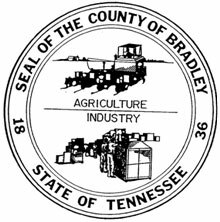 The Bradley County Assessor of Property provides access to information via the world wide web as a convenience to visitors to this site and citizens of Bradley County. Every effort to insure the accuracy of the information contained in this site, has been made, so it can be deemed reliable, but is not guaranteed. When you search and select a parcel, click on the Maps tab across the top to land on the map for the parcel you have selected. Under no circumstances should any information obtained via the internet be relied upon for legal accuracy or correctness. If legal reliance upon information is required, you should consult the official records of Bradley County. DO NOT make any decisions to buy or sell real estate based solely on the data presented on this Web site. Verify all pertinent data prior to making any final decisions. Bradley County, it's officials, officers, agents, employees and all other parties specifically disclaim any and all liability for any damages of any nature, either direct or indirect, caused by or derived from the use of any information obtained from this website.